So, you’ve started your new small business, congratulations! You’re on your way. But now the day-to-day logistics seem to be overwhelming. One of the very first steps you can take to save time and ease frustration is to secure a quality accounting software. The key question is: which one? While QuickBooks is one of the most popular, in all its versions, it is not necessarily the right software for everyone and every type of business. Take some time to ask yourself these questions before you invest in this key component of your everyday workflow. Users. Do you need multi-user access? Will you have only one person working within the system at any given time? Will someone need to be able to access your books from another location? Will you have an accountant review your books periodically? The answers to these questions will determine whether you need a system with online access, multiple user licenses, and/or a feature that easily permits a copy of your books to be shared. Capabilities. What are your specific company and industry needs? Different brands will offer more robust options for inventory, job tracking, reporting, etc. 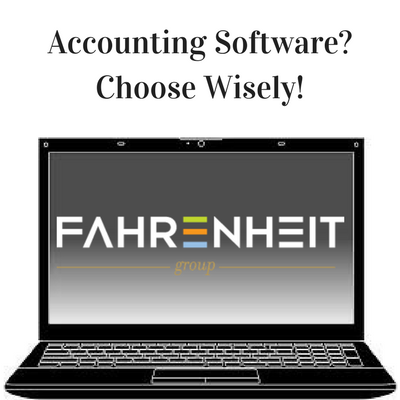 The more intricate your accounting flow, the more likely you’ll need to lean towards an industry specific software. Intuitive usability. This includes aesthetics. Do you like colorful dashboards to show you at a glance how you’re doing? Do you prefer a straightforward list format — lean and clean? Users of this type of software aren’t all natural bookkeepers. This might be your least favorite part of the business. Make it easy on yourself. Choose something that you like the look and feel of best. Customer support. There will be times when you need help. Software of this complexity isn’t intended to be a puzzle, though it can feel that way in the beginning. Do they have a support line? Online support? What are their hours? Do reviews reveal positive experiences from current customers? Are their tutorials easily accessible? While many of us learn much from trial and error, there will always come a time when you need a hand and a concrete answer. Integration. What other kinds of programs are you currently using to manage your business and does the accounting software interface with them? Consider POS systems, credit card processing, inventory, and CRM software. These days, we have these luxuries. Make sure your choice offers you those capabilities to maximize your ROI. Payroll. Will you be using the software to process payroll? While not all offer this option, and for most, it’s an added cost, this is something big to consider. It could mean consolidating applications and saving money. If you choose this route, the follow-up question would be: “Is the payroll tool robust enough to do what I require?” Not all are as flexible as you might need. Consider commissions, time tracking, and piece work, for example. Once you’ve answered all these questions, the next step is to read up! Read reviews, evaluate the capabilities of each brand, and within those, each version they offer. Don’t be intimidated to call, ask questions, and sign up for a demo/trial. While it can seem like a relatively innocuous choice so early in the game, it will matter down the line. Think before you commit. Picture your company a year from now and five years from now. How will your needs change and will this software accommodate those needs? The Fahrenheit Group is a consulting and professional services firm that helps growth-oriented organizations overcome their most challenging hurdles to success, including system requirements, selection, and implementation services. Feel free to reach out to one of our dedicated and highly-experienced consultants for assistance at sales@fahrenheitadvisors.com.